All the books I’ve read this year have changed my life – via new information and/or new perspectives. 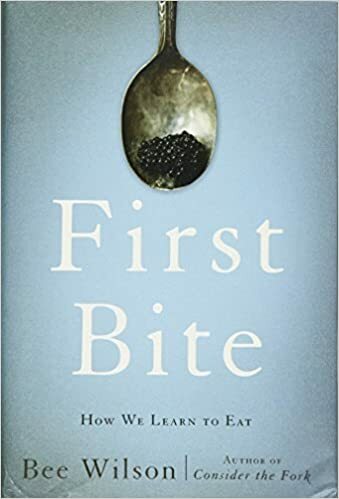 This book, First Bite: How We Learn to Eat, is the only one that changed my family’s life. I accidentally left this book in my sister’s car, and she started reading it. She tried an experiment described in the book, the tiny tastes program, on her picky son, to great success. His palate has been considerably expanded to include new favorites like cherries, asparagus and cucumbers. The program consists of offering the subject an incredibly small amount of the target food over a period of a few days. The subject can also be bribed with a spoonful of their favorite food for successful completion of each “tiny taste.” But because the taste is so small, the subject generally complies anyway. And with repeated exposure to the taste, the subject learns to like the taste. This is exactly the opposite tactic that adults who are picky about eating were subjected to – generally their parents made them eat a whole plate of food they hated without any choice. This program works because it’s not as frightening to eat a small amount of the food and because many children and adults really can enjoy a wide variety of foods if they’re comfortable with them. The most interesting bit of knowledge that I learned from this book is that there is almost no genetic component to our taste. If we were born in a different culture, we would be eating that culture’s food rather the one we currently do. The food we tend to like is food that is familiar to us and that may also be associated with good memories. The food we tend to avoid is food we are unfamiliar with and/or is associated with bad experiences in our past, like being forced to eat a whole plateful of food we hate/weren’t familiar with. The more I read about our personal preferences, it seems like we are really products of our culture. Like how our taste in music tends to run towards whatever was popular (or at least whatever music we listened to) when we were 13. That’s why I’m a 90s music girl, but that’s why most women of my age also listen to the same music. We are all uniquely the same in this way. Our food preferences just show that we are products of our upbringing and how scary the food culture was when we were children. Overall though, people can still change. One way to do this may be to incorporate something like a “tiny tastes” program into one’s own life. Small exposures breed familiarity, which may breed to affinity (though there’s no guarantee that you’ll like something even after a tiny taste). You are not confined to your childhood experiences and instituting small changes can help you change your habits and your tastes (maybe, I’m shooting off the cuff here – it’s a hypothesis). Let’s talk about our traumatic eating experiences! Posted on November 28, 2017 December 22, 2017 by The Give and Get	This entry was posted in books and tagged change, childhood, food, personal preferences. Bookmark the permalink. Remember hating cilantro growing up. Now I just can’t get enough of it. So weird. But the best food in the world is in Malaysia, and then in Japan. Anybody who eats Malaysian food in Malaysia will never feel the same again! I’m one of the rare people who tastes the soapiness in cilantro and loves it anyway. I’ve eaten the Hainan chicken and Nasi Goreng in Malaysia and I don’t know, it’s not really my taste. Agree to disagree!